$217. And that included a hard case, and delivery (syd to melb). 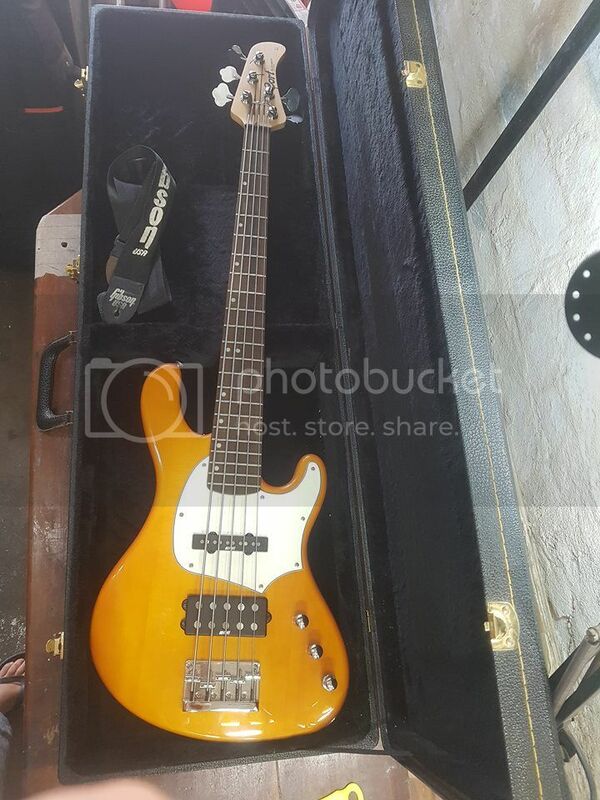 The bass and the case are in great shape. Surprised to see an '05 stamp on the neck heel. It looks much newer than this. I guess the owner was a learner who put it aside after 6 months or something. Plus I didn't know the Indonesian Cort factory had been around for that long. (Actually thanks to google, I now know the Surabaya factory has been around since '95!). Some incredibly good stuff - the machine heads, the fretwork, the compound radius, the satin neck finish, the dual-action trussrod, the neat and accurate wood machining, the bridge-polepieces-neck allignment. Nothing you can’t fix and as long as you don’t get too fussy a good buy. Awesome. Looking forward to seeing what you do with it. Always liked corts. Finally had some time to give the Cort project bass the once over. Wow I didn't know you were twins! Clever little bunny aren't you. Did make me giggle and have a closer look. Keep it orange and put a couple of racing stripes on it. A Confederate flag on the back and call it The General. It's got that Big Bad Orange colour going on that was famous way before hot pants became the feature of the movie. Looking forward to your upcoming video’s on this project Rob. Really interested in seeing how good you can make this bass. P.s. I don't mind the orange, but yeah....daphne blue would look terrific. Thanks Rob, great vid. I watched it all the way through. So interesting! Paint it bright yellow with a black PG. Some of the GB35 basses didn't have a PG. I suspect the PG design is just a machine design error... big, OOPS, though! I don't believe that the electronics (especially the bridge pickup) is stock. That could explain the twisty tie in the electronics cavity. I think that "wood chip" in the finish is actually wood filler in a dent. Which is ok for an opaque finish, but not a translucent one. Yeah, it's a funny one. It is only under by the tiniest amount. Actually I looked at it more closely the other day (editing vid now), and if I simply put the neck in first with the PG off, when I lay the PG down on the body, the screws still line up ok. And I may actually use a shim under the heel to get the angle just right, and this will lift that extension up anyway. You are right. It is definitely an amateur installation with masking tape on the solder joints etc. With the magnifier I've now spotted "spector bass" written on the circuit board. I have no idea what pre it is though. I ran some freq sweeps and it doesn't match what I can find about the tonepump preamps. I've also heard that these are a descrete fet design, but this pre is bassed around a tl062 dual opamp. The treble control boosts a lot of high mids and low treble, peaking/shelving at around 2.5khz. And the bass control has no hpf, iow, it cuts and boosts all the way down to 20hz. Plus the pre has a set lpf at 10khz. The pickups are both Mighty mite. The neck p'up is a (very hummy) single coil, and the bridge pickup peaks around 4khz, (so I would think it is wired in series.) They are both alnico mag pickups. The battery box is fishman, and it is certainly original, judging buy the fitment in the route, and the fact that the route has berocca coloured lacquer in it! Hi guys. Here's how I fixed the neck pocket. If you aspire to do a bit of tech work, or put together parts basses or whatever, the fitment of the neck heel is critical. Not just for tone, but for intonation. If the neck can shift in the pocket, you really can't expect the strings to stay in tune. Thanks again, for the kind words about my vids. Put a like on YT this morning for you Robb. If that's not a refinish then why the poor pocket prep and cheap screws? Great stuff and well narrated. How do you determine whether or not a shim is required in the neck pocket?